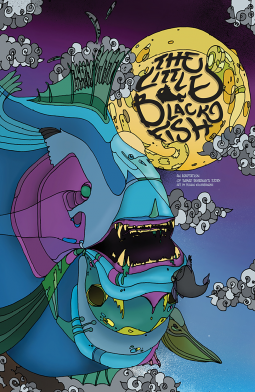 The Little Black Fish is the story about a fish who questions her boring life and her superiors, and decides to travel the world and find what is out there. I only realized it was a 'she' after re-reading the synopsis, I'm not sure if I missed something. But anyway, I think she was too proud for a young fish who is supposed to be traveling the world and learning from other creatures. She has an attitude that wouldn't go well at all in the real world, specially when she met someone new who didn't think as her and she said "I’ll forgive you since you’re speaking out of ignorance." The story itself is based on a classic book I haven't read, so I can't compare it. I understand it's about being free, questioning authority and life and overall being brave to discover more and create your own journey, but in this case I didn't think the story itself had a good ending. The character was too proud and acted rude a few times, not even considering or showing respect for other creature's life and beliefs, believing she was better. I'm not sure what else to say about this book. It hasn't been my favorite. I didn't really liked the art but not because it wasn't good, but because it was difficult for me to understand the illustration and sometimes got lost. But it was an interesting book, something totally different from what I usually read.